Collecting just the amount we need for the kitchen or ritual. Some herbs such as basil are better collected by simply pinching out the growing tip leaves on the tallest branches, if done correctly, the branches then after some days split into two branches thus creating a more bushy plant with many leaves. Others like rosemary, have a woody stem that is easier to snip off in its entirety. During the Summer/early Autumn months harvesting leaves and stems will encourage new growth in the plants. If its flowers such as chamomile - collect the blooms after they've fully developed and opened. If its seeds - be sure to wait until the seeds have fully developed and begun to dry and turn a dark colour. To collect entire bundles of herbs, snip off the stems where they branch off from the main plant, this encourages new growth and also makes them easier to hang up in a bunch. Hang them upside down in a bunch in a warm dry spot. A drying screen helps dry leaves or sprigs. Make your own from an old window screen or hardware cloth mesh stapled or pinned to scrap wood or an old picture frame. Place cheesecloth or mesh over the screen and place the herbs on the mesh. The herbs will take from a few hours to several days to dry fully. Never Harvest more than 10% of each plant, unless its end of season. Harvest on a sunny day. Harvest on a dry day. Wait until the morning dew has evaporated. Once harvested, keep them out of direct sunlight. Use a basket with a tea towel to keep the herbs covered. Start the drying process as soon as possible after collection. Give thanks in some way or another to the plants before and after collection. Different plants take different amount of drying times, anything from a couple of days to a week is the average. When the herbs are crisp dry, remove the leaves from the stems and try to keep the leaves as whole as possible. When the leaves are crumbled the dried leaves release their aromatic oil. The dried leaves are best kept in glass airtight containers. 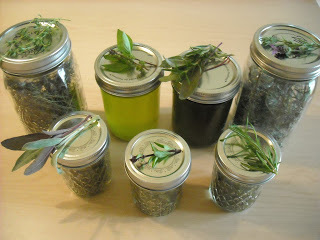 Any old washed and cleaned jam jar, pickle jar, honey jar will do the job and keep our herbs potent for the next year. Dried herbs usually keep for a year, any left over can be used for craft projects such as soap making & potpourri or sprinkled into a candlelit bath tub. Herbs can be used for a great variety of things, from simply sprinkled over the dinner, to advanced magic rituals, one thing is for sure no matter how herbs are used in life, life itself becomes greatly enriched by bringing in the herbs. 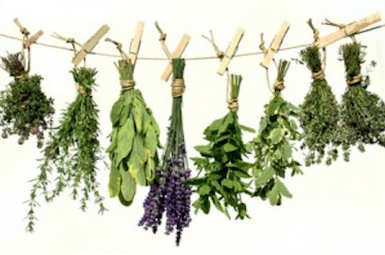 Fresh or dried herbs, infused in oil. Fresh or dried herbs, infused in vinegar. Added to the bath water, herbs such as lavender, rosemary, eucalyptus leaves. For shampoo or soap making. For ritual work, innovating certain Dieties, and energy.